When her father, Carl Fogelin died, local children’s book author, Adrian Fogelin, decided to use his home to serve the children of their Southside neighborhood, Seminole Manor, by turning it into a very local library, one that kids could get to on foot or by bike. With the help of Dr. Kary Kublin, a neighbor and educator, the Front Porch Library opened its doors on June 13, 2009. Since then the library, which now has more than 2,000 catalogued books—all donated—has offered weekly programs including read-a-thons, Salsa dancing on the lawn, simple machines, explosive science and quilt making. The Front Porch Library, an all-volunteer effort, is run on a shoe-string budget. On October 18, Carl Fogelin’s birthday, a fundraiser will be held to help support this much loved center of community events. 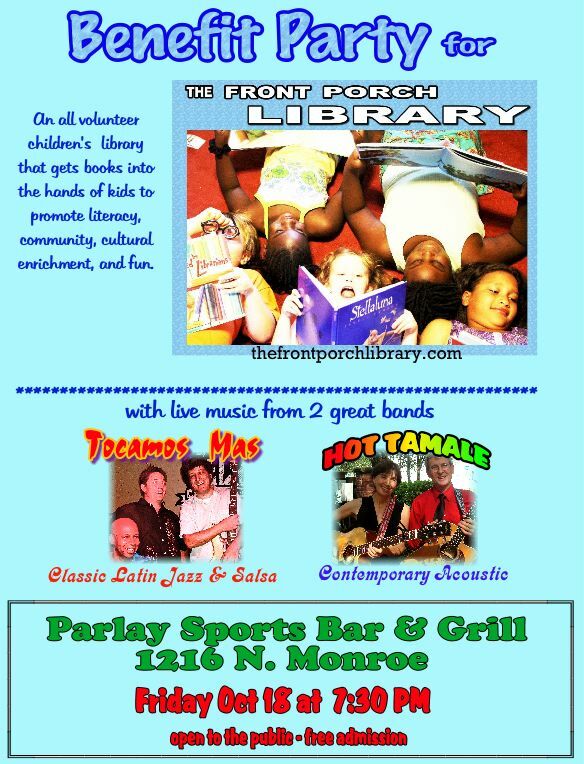 Musical entertainment for the evening will be provided by acoustic duo Hot Tamale, known for delivering showy, upbeat performances all over the Big Bend area, and Tocamos Mas, a band that packs local venues with its signature sound of smooth Latin jazz and salsa. The event will be held on the spacious, covered patio of The Parlay Sports Bar & Grill, one of the newer additions to the vibrant midtown entertainment area. The evening of music is free and open to the public. Donations will be gratefully accepted. Funds raised will buy craft supplies, snacks, and educational toys to sustain this grassroots effort at community and literacy. As the motto of the Front Porch Library says, the neighborhood that reads together succeeds together.